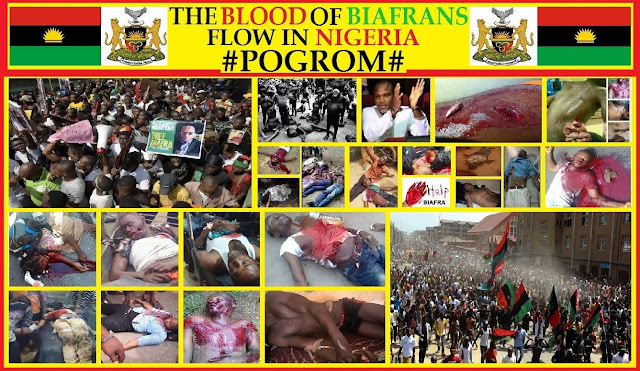 The Indigenous People of Biafra, IPOB, on Wednesday, February 11, 2016 stated that over 1, 000 of its members have been killed since the arrest of their leader, Nnamdi Kanu. The statistics was stated by the group’s Media and Publicity Officer, Mr. Emma Powerful during a press brief with newsmen in Nnewi, Anambra State after their meeting to review their activities and to determine options that will be followed to check the incessant killing of their members who are engaging in peaceful protests. He said: “We wonder what these soldiers and policemen who are killing our innocent members because they embarked on peaceful demonstration to demand the unconditional release of our leader and Director of Radio Biafra Mr. Nnamdi Kanu, are doing in the South East when their marksmanship is needed in the North East to check the activities of the Boko Haram insurgents who are killing people on a daily basis. “The case of our leader has exposed the emptiness of APC government in Nigeria and some ex-presidents of Nigeria who are supporting the extra judicial killing of harmless IPOB members who have not carried guns or any dangerous weapons for a day. “If the present government of APC in Nigeria is responsible, law abiding, respectful to Nigerian constitution, and the orders of court of competent jurisdiction, Mr. Nnamdi Kanu has no business still being incarcerated. No IPOB member or anybody should be shot while engaging in peaceful protest but because this is a government of frustrated, confused and power hungry people who never thought that they will ever lead Nigeria for one day, they use intimidation to shoot people as if they are still in the military era. “We know the activities of a former president of Nigeria who has been visiting and interacting with the Abia State Governor, Dr Okezie Ikpeazu, on how to deal with IPOB members in Abia state.The former President has been romancing with the APC and we are looking forward to seeing him declaring for APC. Let him be bold enough to do that instead of working with Abia state Governor to push out IPOB members for their pay masters in APC. We know their role in the killing of our members and very soon, we will ask them questions.